For cattle producers, their animals are everything — their livelihood, their time and, in many cases, decades of hard work. But what if that livelihood started to disappear without a trace? For cattle producers, their animals are everything — their livelihood, their time and, in many cases, decades of hard work. But what if that livelihood started to disappear without a trace? For Betty Green and an increasing number of Manitoba cattle producers, it's a reality and wolves appear to be the culprit. "You can see them in the afternoon and go back in the evening and that calf has just disappeared," Green said. Green had operated a cow/calf farm and feedlot near Fisher Branch, Man., a town about 140 kilometres north of Winnipeg, since 1982. In 2016, she lost six animals to wolf attacks. And those are just the ones they were able to find. "It's devastating," she said. "We put a lot of work into making sure these animals are born and off to a good start." Green estimates the number of animals her family has lost to wolves in the last year is more like 10 to 12, higher than previous years and a figure that has been steadily increasing in the past three years. "It started out just with more sightings of wolves in the area," Green said. "Then gradually we started to realize we were losing calves." It's a problem that adds up in the pocketbook very quickly. Green said a steer can net $1,500 at the market. Green believes a decline in moose and elk populations in the Interlake is forcing wolves to take bolder, riskier actions to get food. A wolf once had to be shot right in her yard. Another made its way into a calving pen, killing one calf. "They're pretty smart animals and when they're hungry it doesn't take them long to kill an animal," she said. Green isn't alone. 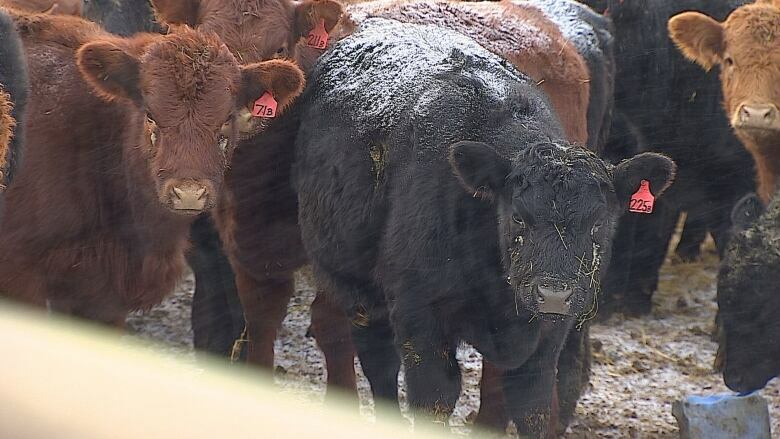 Ramona Blythe, vice-president of the Manitoba Beef Producers, said wolf attacks are coming up more and more often at producer meetings across Manitoba. "It's getting to be a bigger and bigger issue," Blythe said in a phone interview while working on her farm in central Manitoba. "It's no different what kind of animal it is," she said. "It's your livelihood, it's your production so it's traumatic." Wolves have also intruded on urban life recently. A wolf was spotted this month in an urban area in West St. Paul, Man., and in 2015, wolves killed four dogs near Victoria Beach. Blythe said producers can get compensation for animals lost to wolf attacks, however the amount paid out is only equal to the animal's value at the time it was killed. Producers also need proof of the kill. Without proof, compensation can't be paid. It's time and money lost that producers can't get back, Blythe said. "It doesn't take them [wolves] long to clean an animal up," Blythe said. "No evidence of what's happened." She said the group is working with provincial officials to come up with a solution. In the meantime, Green enlisted the help of the Manitoba Trappers Association and had hunters trap wolves around her farm. She's also installed cameras around her farm to monitor what is coming near the farm. She's also checking on her animals more and more often. But until there is a solution, she said the threat of wolves will be a constant worry. "Each year at this time of the year we're starting calving and it's just another one of those real worries that you have," she said.